Six years after the last Teen Titans episode aired, the old gang has come back together in a series of shorts as part of CN's new "DC Nation" programming block. They are amusing and have the exact same kind of writing, acting, and design aesthetic as the old show, which was my #1 favorite on TV during the period in which it ran. Nothing would please me more if CN finally got its act together and started producing new seasons, which was why I made this bit of speculative fanart (okay, there sre many other things that would please me more, but you get the drift). 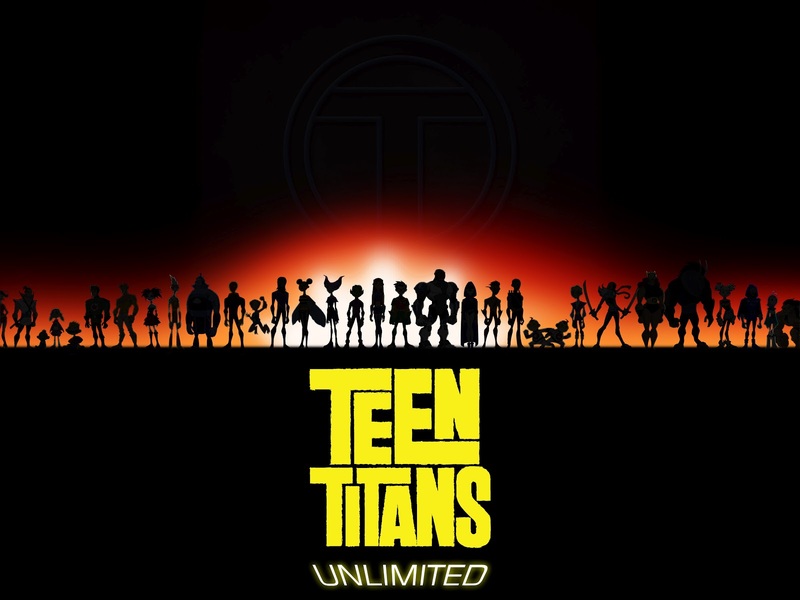 This is, of course, a takeoff on the iconic lineup imagefrom the opening to Justice League Unlimited; in the final issue of the recursive comic book adaptation Teen Titans Go!, which continued after the show itself had been canned and hence less bound by executive meddling, the writer teased the fans by having Robin say the team was going to "go unlimited", referring to the transformation from the seven-man Justice League roster to the beefed-up JLU continuation--a logical next step already speculated by fans after the series finale, when a whole host of teenage heroes (most of them seen in the above image) had been gathered together to assist the main team. On a side note, you would not believe how hard it is to find good quality pictures online for some of the Titans. UPDATE: Aha! Tumblr is being very kind to me now, even better than the first time. First used in a posting by titans-confessions (which funnily enough I discovered and read through earlier this week), it has since been reblogged and liked by far, far too many to mention here. Thanks guys! Titans go!